Carluke Rovers stalwart Ian McKnight has revealed that he is resigning as club chairman this summer after three years at the helm, writes Craig Goldthorp. Speaking exclusively to the Carluke and Lanark Gazette, McKnight (56) said: “This is my last season as chairman. “My family need me now. I got two grandsons last year and maternity leave is finished so my time and efforts are needed elsewhere. “My own kids need their time to enable them to go and earn a crust. “I’m fine about leaving Rovers. Everybody has a shelf life. “I took early retirement three years ago which I’m really enjoying. “At the moment there is no-one lined up to take over from me as Rovers chairman. Rovers didn’t have a game last weekend but return to competitive action this weekend in a daunting Ardagh Group West of Scotland Cup quarter-final tie at junior giants Auchinleck Talbot. “We are the underdogs and our expectations aren’t particularly high,” McKnight said. “We are going out there to enjoy the game first and foremost and enjoy the occasion. “We hope to get the breaks that will allow us to attack and show our prowess against the national champions. Despite the high possibility of a heavy defeat at Auchinleck this weekend, Ian explained that it will be a profitable day for Rovers whatever the result. “We are looking to add to the club coffers and the bank balance,” the Rovers supremo added. “Getting half the gate money means we look forward to getting more than double or treble the money we get for a normal home gate. 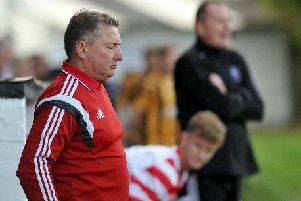 “If we manage to get a draw and bring them back to Carluke that would be a mini dream come true. * Carluke Rovers’ Clydesdale rivals Forth Wanderers were defeated 3-2 at St Anthony’s in a League Two encounter last Saturday. Forth took a freak ninth minute lead when Ryan Cherrie’s flighted free-kick from distance evaded everyone and ended up in the net. But goals by Fitzpatrick and Smith put Ants 2-1 ahead at half-time. Wanderers levelled when Redouane Boulbrachene rounded the keeper and scored but Fraser Wheatley netted a 76th minute winner for the hosts. Forth host Vale of Leven in the league this Saturday, KO 2pm.